Nothing screams opulence like a Bentley. It’s the vehicle of choice of every moderately successful baller and rapper out there. Sometimes, a Mercedes just isn’t good enough, so this is what you buy instead. This is a Bentley Bentayga, which you will often hear name-dropped in rap music as the “Bentley truck”. In fact, there are numerous songs titled just that. I used to mispronounce this car as the Benty-aga (which sounds better anyways), but then I took a closer look at the spelling and realized I’ve been saying it wrong the whole time. 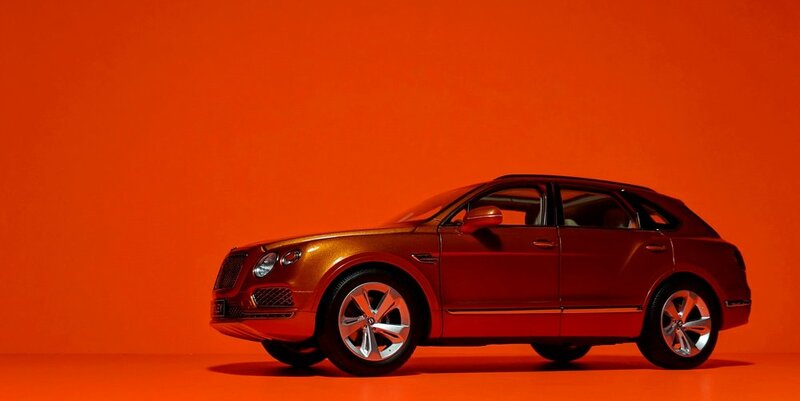 In any case, this is Bentley’s first attempt at a SUV. Not only that, but they went ahead and made it the most expensive SUV in the world, because that’s kind of the point. Go big or go home. It doesn’t hold the title as the fastest sprinter in its class but, behind its unassuming looks, the Bentayga hides more power under its hood than anything you’ll find at an exotic rental dealership. The abundance of high-quality materials and sound-deadening throughout the vehicle drive up the weight significantly, which is why it needs every ounce of that juice. In the “comfort” and “amenities” departments, I’m sure it’s unparalleled. I’m also sure you could comfortably live in one of these if you really had to. 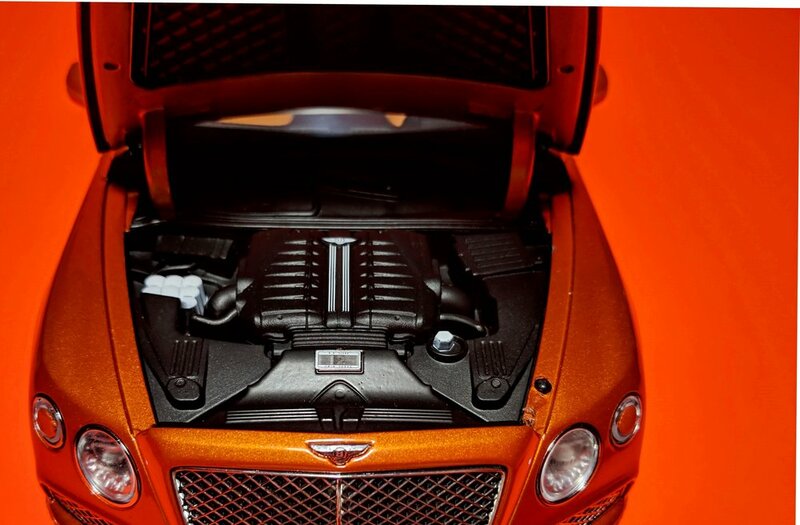 Bentleys might not be popular among the enthusiast groups but, love or hate them, they make for interesting subjects in scale model form because you want to see the extent to which these companies replicate the wealth of details in these cars, particularly on the inside. If you wish to stop reading right here, just know this Kyosho is really, really good. I never thought I would need a Bentley in my collection, ever, but a clearance sale prompted me to grab a few of them just for entertainment’s sake. Turns out these are actually pretty neat, and I can’t seem to stop staring at the damn things. 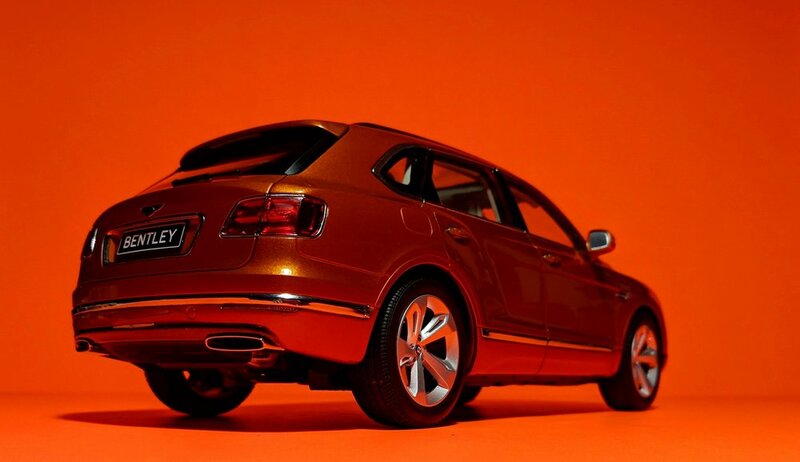 Starting with the exterior first, this Orange Flame Bentayga is a rather handsome vehicle in my opinion. It walks the fine line between classic and modern, simple and elegant. The overall features of the car are similar to those of the Volkswagen Touraeg, but obviously in a more look-at-me manner with all of that chrome trim. The grilles are solid here, but the tidy chrome-work makes them convincing enough. I’m a fan of Bentley front fascias; I like the stark contrast in shapes between the squared grille and the circular headlights. 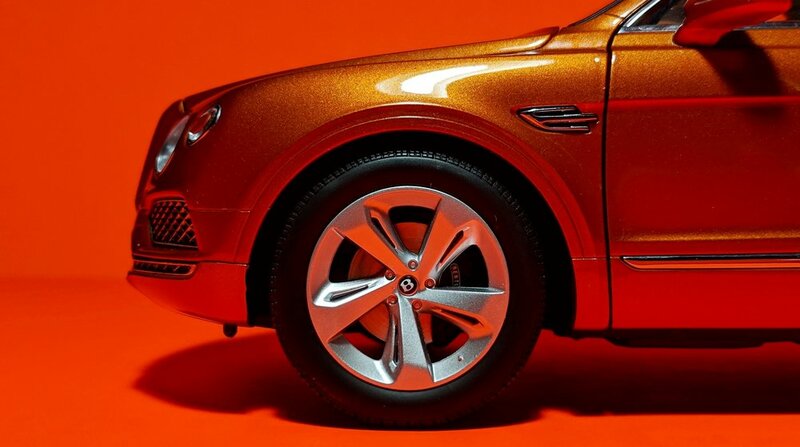 Bentley’s use of simple geometric shapes, in general, is nothing short of genius. The elliptical exhaust pipes are fantastic. In a world where creases and angles are overdone, their design philosophy—predominantly straight lines and flat surfaces, with rounded edges—is refreshing. 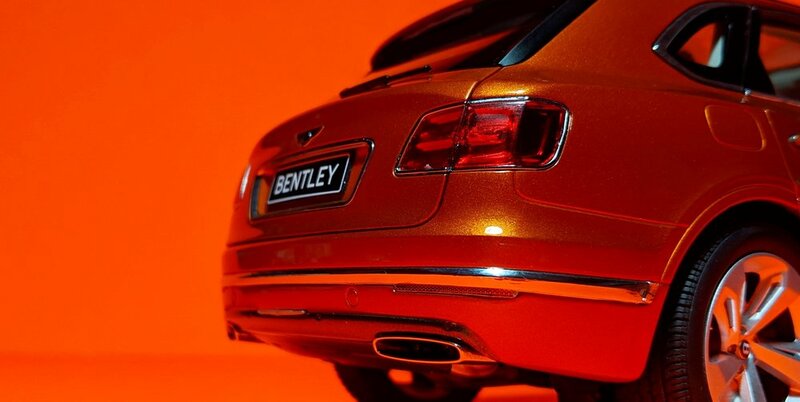 Door alignment is an issue, as it has always been with Kyosho models—ironic because Bentley’s forte is craftsmanship. And, as is customary with Kyoshos, you press a button under the front bumper to “pop” open the hood. Doing so reveals the thick, hideous dogleg hinges that don’t belong on a $200 model. There are a few scant details in here, but nothing worth mentioning except some adhesive residue that found its way into the engine bay. Other issues include a wonky front suspension and steering assembly. Their quality control needs some work, but that’s probably why the manufacturer discounted them in the first place. And that’s a trade-off I’ll take any day. The main course, obviously, is this Bentayga’s sumptuous cream-and-nougat interior. The windows are not tinted on this model, perhaps to better direct you towards the goods. Expecting leather-wrapped seats on a glorified toy is a stretch, but the plastic used on the seats are of the softer, slightly-rubbery variety in contrast with the hard plastics on the dash and door cards. It’s a nice touch, pun intended. And I’m not going to lie, but the interior smells pretty good too. (New car smell?) Of course, you’re going to find the usual standard features of a high-end model (seat belts, felt carpeting) but here, the most impressive part of this interior is the printing on all of the dials and gauges, which extends all the way to the individual seat and window controls. Bring your magnifying glass. If I could do an Ant Man and shrink myself eighteen times, I’d probably habitate myself in this one. Sometimes, the best models are the ones you never expect. I said I didn’t want or need a Bentley, but you never know what you’re missing out on until you try it.